Mention Loei and what comes to mind are the province’s “3 Emeralds”: Phuk Kradueng, Phu Luang and Phu Ruea. 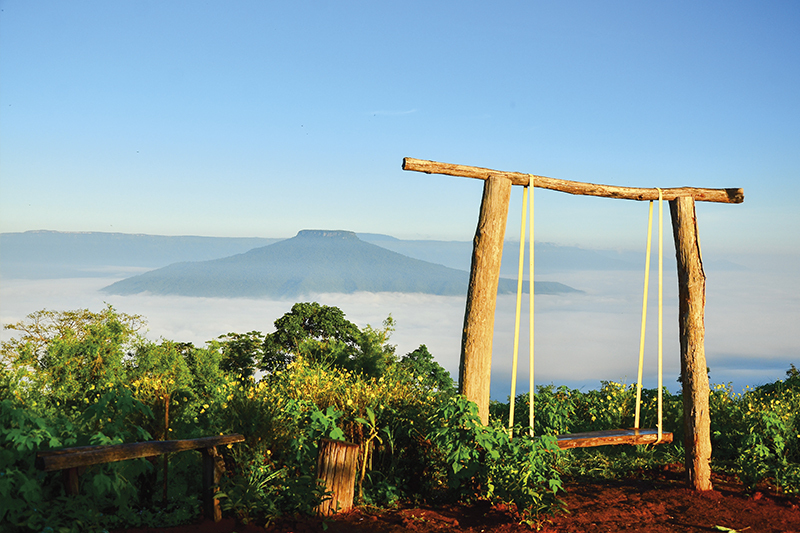 Despite the superb scenery of these big mountains, Loei has other attractions that will simply tickle your fancy. 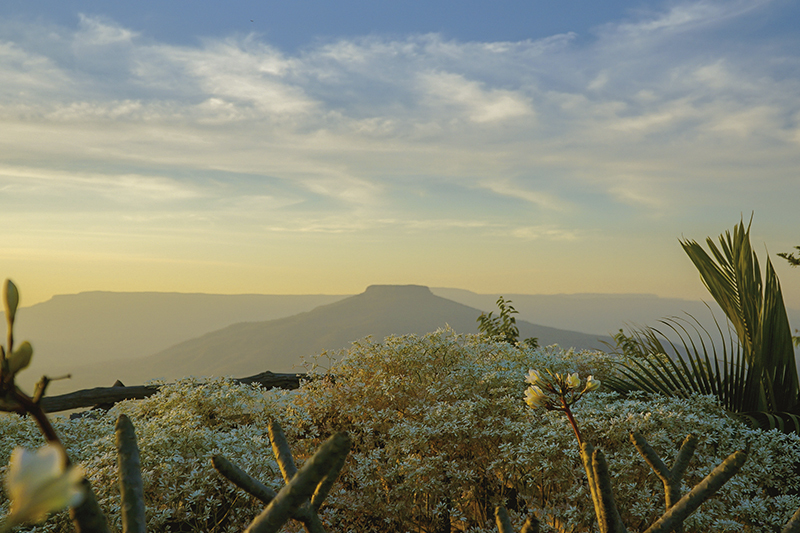 With the cool weather still lingering, February is a good time to explore Loei’s natural attractions by car. Visitors can fly from Bangkok to Loei’s nearby provinces and rent a car from there. It’s best to start the trip in Loei’s Muang district. First, head south along road 201 for 45 minutes and you’ll arrive in Nong Hin district known for its stunning mountain scenery and cool weather. 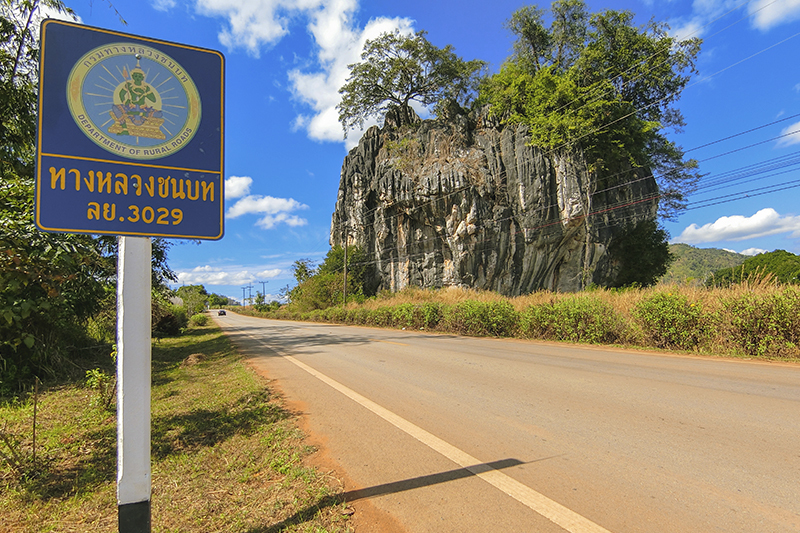 From there, drive along rural road 3029 past Phothisat Cave and Suan Sawan on the way to Suan Hom Waterfall. Nestling in a forest with sparse foliage, the medium-sized waterfall cascades down the limestone hillside that’s so rich in minerals that rocks and boulders shine in sunlight in shades of burnt ochre. With different types of trees growing along the waterway, the waterfall looks just like a botanical garden that’s ideal for a picnic or frolicking in the water. Not far from the waterfall is Suan Hin Pha Ngam on Nong Hin-Suan Pha Ngam Road (3029). The limestone mountain is often called by its moniker “Kunming of Loei” because it looks just like the Kunming Stone Forest in China. 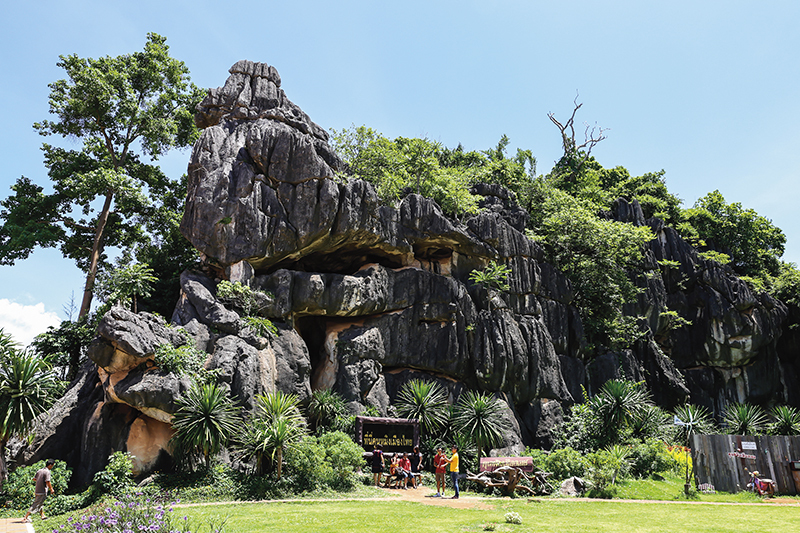 Adventure types will enjoy a walk along a nature trail that runs through a series of rock crevices and openings surrounded by the massive grey limestone mountain with pointed tower-like natural stone structures and different species of strange wild plants. A kilmetre down the road from Suan Hin Pha Ngam is Phiang Din waterfall, a small limestone cascade that flows gently in a serene atmosphere. Visitors can follow a nature trail leading to the hilltop to see the water flowing down the hillside. A drive along rural road 3029 for 3 kilometres takes visitors to Ban Pha Wai village’s tourist information centre. Then take a ride for 2 kilometres in a local off-road vehicle to get to Phu Pa Poh mountain. Phu Pa Poh used to host a dense bamboo forest. The hilltop has 4 viewpoints, 3 of which can be accessed by off-road vehicle. The fourth one, the most beautiful, can be reached by foot. The hilltop offers a sweeping view of Phu Hor mountain. The sea of mist here in the morning is incredible. If the midday weather permits, the hilltop is a good vantage point to see some of the natural wonders in 3 nearby provinces: Nam Nao National Park (Phetchabun), Phu Pha Man National Park (Khon Kaen) and Pha Sam Yod (Nong Bua Lamphu). The Phu Pa Poh hilltop also offers a breathtaking panorama of other famed mountains and attractions including Phu Hin Rong Kla, Phu Luang, Phu Kradueng, Phu Pha Jit and Khao Kho. 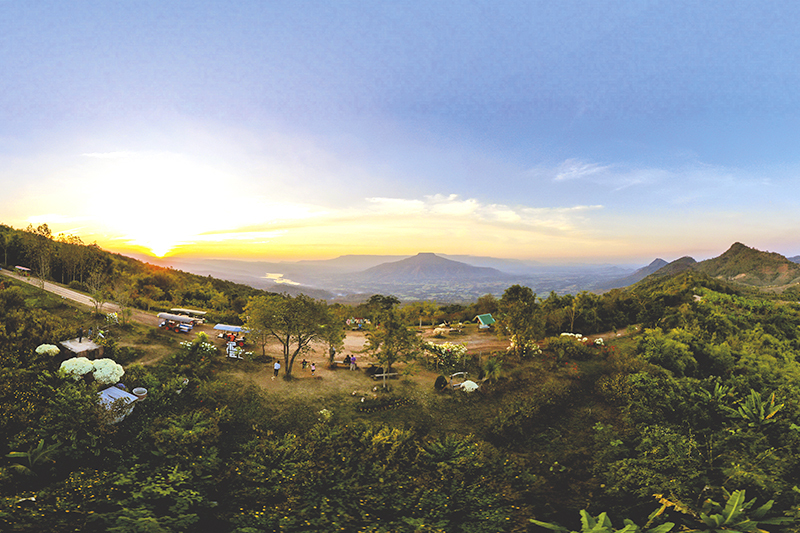 With an enormous wealth of natural attractions, Loei can effortlessly win any visitor’s heart. Getting there: THAI Smile flies daily from Bangkok to Udon Thani and Khon Kaen, which is an hour away. Visitors are recommended to rent a car for the drive to Loei. Visit www.thaismileair.com. More info: Call the TOT office in Loei at 042 812 812, 042 811 405.